Coombsville? Where in the heck is that? Just to the east of downtown Napa, about a ten minute drive from the inn. The region has applied to become the newest appellation in Napa and hopes to see that happen in the next year or two. In the meantime, before it gets too busy and popular, our friends Don and Kathy from Platypus Tours wanted to introduce us to Jordi and Pilar, the caretakers and managers of the vineyard, who come all the way from Spain to live in Napa. I wasn’t sure what to expect as we drove up to this home set back in rural Napa, but the friendly host (the one with the bone in his mouth on the grass) set the tone for the whole tasting. Pilar made me smile when she opened the door and said: “I’ll save hugs for when you go!” She shook our hand, introduced Jordi, and we were welcomed into their home that is the tasting room. With a magnificent view of the vineyards from both the kitchen and the deck, Jordi explained that Marita’s Vineyard is owned by the Montes family and, especially, by Bulmaro Montes, the patriarch, who is the person who was with Phelps for 30 years who has seen his lifetime dream fulfilled with Marita’s Vineyard. “We are his “compadres” and that is why we do what we do (it transcends caretaking for us), because we both consider each other family.” We did not meet Bulmaro because they try to keep him away from vineyard in the afternoons so that he can enjoy his family. 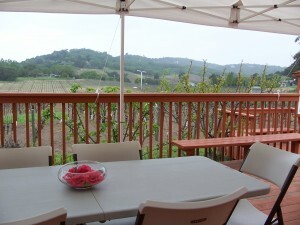 Otherwise, he is here 5-6 days a week tending the vineyard and he also participates in the tastings. Jordi went on to say that Marita’s Vineyard is a small produce of wines- just two!- but that a guest could enjoy a small repast with the tasting created by Pilar; tapas-style eats that paired beautifully with the wines. She made a wonderful potato cake, some croquettes, presented us with some excellent cheeses and nuts, and then some dark chocolate. More extensive tastings were available if you wanted to do a “vertical” tasting- tasting the same wine but from different years; this option allows you to understand how climate can affect change in the flavor from year to year, or how the winemaker would choose to differentiate the wines with different blends. The wines were exquisite, and the food was superb; but it was the company of Jordi and Pilar that make this experience so worthwhile. Their questions, their stories, the way they slowly weave you into the life of the vineyard, their own lives, the production of wines, the recipes behind the food. Over the course of an hour, or two, or three- how long you sit at table sipping wine and looking at the vineyards and talking with Jordi and Pilar is up to you. They want you to stop, slow down, enjoy the view, engage the wine, and let the flow of the moment carry you along and calm you down. Eventually you come to enlightenment. This isn’t about the wine- it’s about relationship. Suddenly you are part of the their family, feeling at home, comfortable, and you don’t want to leave. By the time it was over there was no hesitation about hugs- we were leaving good friends! Most of all, it includes the gift of friendship presented to you by Jordi and Pilar. 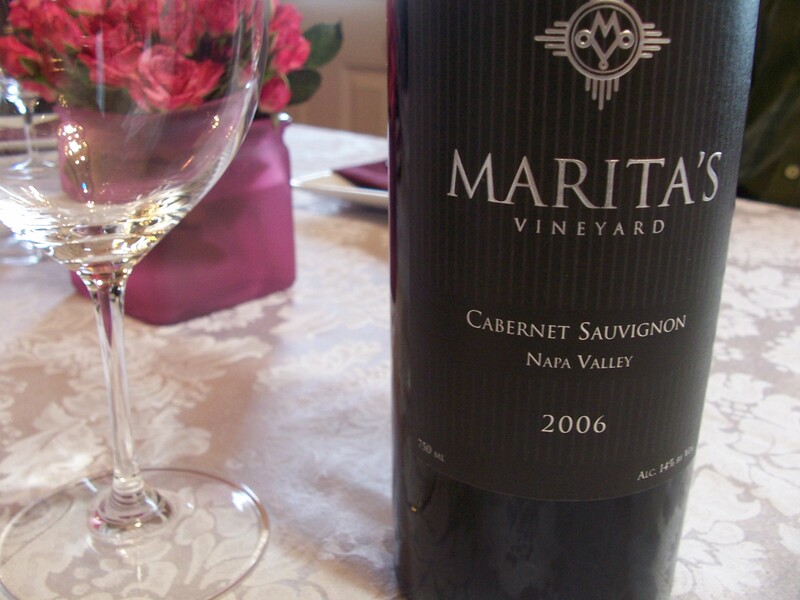 For those who are looking to purchase small production wines with exquisite taste, Marita’s is for you. The price on the wine runs from $90 to $150 and is a great addition for any wine librarian. 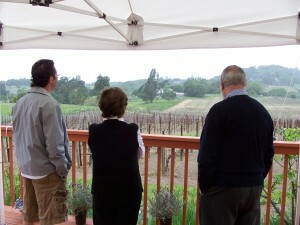 This entry was posted in Cabernet Sauvignon, Food Tasting and Pairing, Wineries by Innkeeper Jim. Bookmark the permalink.